Eating disorder treatment can be delivered in a variety of settings. Understanding the different levels of care and methodologies can be helpful when selecting a provider. It’s also good to understand types of treatment because insurance benefits are tied both to diagnosis and the type of treatment setting. The list below is ordered from least intensive to most intensive treatment levels. Perhaps one of the most important considerations when selecting a psychotherapist is the type of therapy they provide. Different therapies work differently for different people, and some may be more helpful than others, depending on the person and their stage of recovery. Reducing eating disorder behaviors is generally considered the first goal of treatment, and the following therapies currently have the most evidence for effectiveness. Treatments are listed in alphabetical order. The goal of ACT is focusing on changing your actions rather than your thoughts and feelings. Patients are taught to identify core values and commit to creating goals that fulfill these values. ACT also encourages patients to detach themselves from emotions and learn that pain and anxiety are a normal part of life. The goal isn’t to feel good, but to live an authentic life. Through living a good life, people often find they do start to feel better. A relatively short-term, symptom-oriented therapy focusing on the beliefs, values, and cognitive processes that maintain the eating disorder behavior. It aims to modify distorted beliefs and attitudes about the meaning of weight, shape, and appearance, which are correlated to the development and maintenance of the eating disorder. CRT aims to develop a person’s ability to focus on more than one thing. CRT targets rigid thinking processes considered a core component of anorexia nervosa through simple exercises, reflection, and guided supervision. As of 2017, CRT is being studied to test effectiveness in improving treatment adherence in adults with anorexia; it has not been tested in other eating disorders. A behavioral treatment supported by empirical evidence for treatment of binge eating disorder, bulimia nervosa, and anorexia nervosa. DBT assumes that the most effective place to begin treatment is with changing behaviors. Treatment focuses on developing skills to replace maladaptive eating disorder behaviors. Skills focus on building mindfulness skills, becoming more effective in interpersonal relationships, emotion regulation, and distress tolerance. 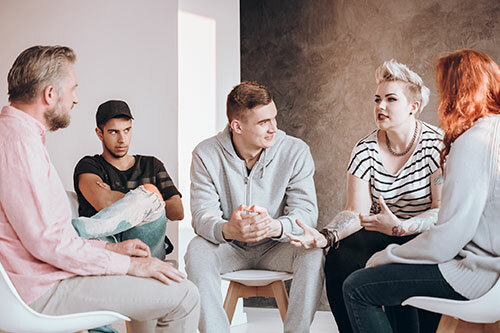 Although DBT was initially developed to treat borderline personality disorder, it is currently being used to treat eating disorders as well as substance abuse. It is important to note that while all of these therapies are frequently used to treat individuals with eating disorders, they have varying levels of efficacy and research supporting their use. Many professionals now recommend the use of evidence-based treatment, which is “the conscientious, explicit and judicious use of current best evidence in making decisions about the care of individual patients.” In eating disorder therapies, evidence-based treatment usually means that the therapy has been used in a research study and found to be effective in reducing eating disorder symptoms, encouraging weight restoration in underweight patients, and decreasing eating disorder thoughts. Classifying a therapy as “evidence-based” doesn’t mean that it automatically works for everyone; just that it works for many patients. Do some research and evaluate which types of treatments would best target the relevant symptoms and psychological concerns. Also keep in mind that not all therapists who say they utilize a type of treatment actually use it in all of their sessions. Some CBT therapists, for example, might have a primarily psychodynamic approach and only occasionally use CBT principles. Ask about how strictly the therapist adheres to treatment guidelines, what a typical session might consist of, how much training the therapist has received in this particular treatment modality, the rough percentage of patients who they treat using this form of psychotherapy, and how current their ED knowledge base is. Also known as the Maudsley Method or Maudsley Approach, this is a home-based treatment approach that has been shown to be effective for adolescents with anorexia and bulimia. FBT doesn’t focus on the cause of the eating disorder but instead places initial focus on refeeding and full weight restoration to promote recovery. All family members are considered an essential part of treatment, which consists of re-establishing healthy eating, restoring weight and interrupting compensatory behaviors; returning control of eating back to the adolescent; and focusing on remaining issues. Interpersonal psychotherapy (IPT) is an evidence-based treatment for bulimia nervosa and binge eating disorder. IPT contextualizes eating disorder symptoms as occurring and being maintained within a social and interpersonal context. IPT is associated with specific tasks and strategies linked to the resolution of a specified interpersonal problem area. The four problem areas include grief, interpersonal role disputes, role transitions, and interpersonal deficits. IPT helps clients improve relationships and communication and resolve interpersonal issues in the identified problem area(s), which in turn results in a reduction of eating disorder symptoms. Just as interpersonal dysfunction is linked to the onset and maintenance of eating disorder behaviors, healthy relationships and improvements in interpersonal functioning are linked with symptom reduction. The psychodynamic approach holds that recovery from an eating disorder requires understanding its root cause. Psychodynamic psychotherapists view behaviors as the result of internal conflicts, motives and unconscious forces, and if behaviors are discontinued without addressing the underlying motives that are driving them, then relapse will occur. Symptoms are viewed as expressions of the patient’s underlying needs and issues and are thought to be resolved with the completion of working through these issues.